Hire Your Day offer a complete styling & design service and with such a creative team with us the ideas are always flowing! 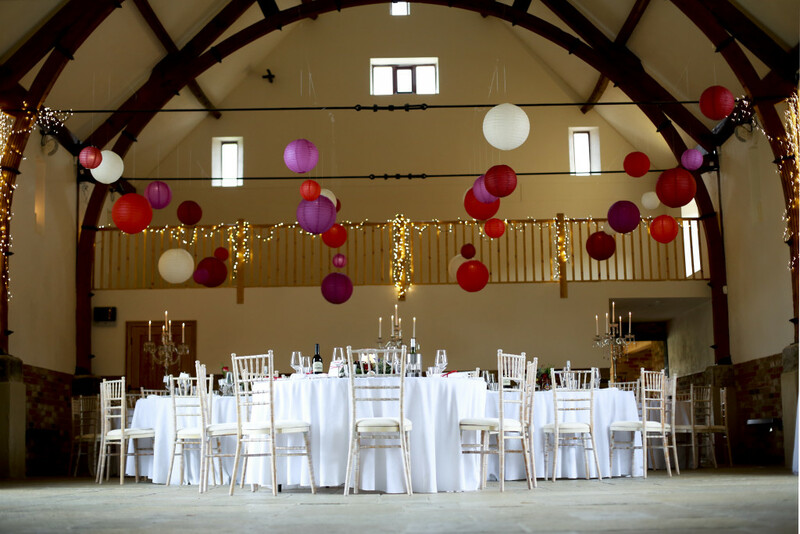 From drapes entwinned with fairy lights, paper lanterns (of which we are proud to be a professional installer from The Hanging Lantern Company), festoon and uplighting we could go on and on! We have transformed the basic village hall into a romantic reception. The most rustic of barns into a magical space and with marquees and teepees the list of styling is endless and gets us all very excited! As much as we pray it wont rain on your wedding day dont be caught short. Brollies will make your guests comfortable for a sunny or rainy outdoor ceremony and keep you dry geting from one venue to another. Please contact us about our special reservation service on offer, reserve your umbrellas for a minimal fee and if the forecast the week before the wedding is looking good we can cancel your order but you have the reassurance that they are reserved should you need them. Here at Hire Your Day we are always looking for different ideas for decorating chairs. We offer the traditional white chair covers with sash but also include beautiful cascading ruffle hoods, dripping pearls and crystals tied to the side and finished off with a vintage brooch or garden flowers, tumbling ribbons we could go on and on! With a DIY or FITTED option the choice is yours. We have a range of light up letters for you to browse through. Whether you prefer the crisp white 5ft ones or the more rustic metal and wood 40cm ones, or in between 80cm option. Have a nosey through and take your pick! Hay bales are a great addition to any party. Ours are wrapped in clear netting by ourselves to contain the hay (so as not to scratch legs, ladder stockings) and create less mess (trust us, this pleases venues!). We can create sofas, tables, benches, even paddling pools! A recent one has been ‘Hook a Duck’ which went down very well! Games are not just for the children! Insanely fun games that guests of all ages will love. We offer a range of larger than life games as well as some summer village fete options. We offer a wide selection of postboxes. As wellas traditional postboxes, there are alternatives, a suitcase or personalised crate perhaps? All our postboxes are lockable to keep your cards safe. Table Plans have come into their own in recent years. Gone are the days of a piece of mounting board with printed rectabgles with guests names on. Individual vintage picture frames suspended by ribbon, an ornate mirror with handwritten tables in chalk pen, or why not use our rustic crates towered up with potted flowers to display your table plan. If you are looking for something different please get in touch for some examples & inspiration. Whether you are looking for a simple vase to pop some handpicked flowers in, a glitzy trio of crystal globes with scented candles or an elegant candelabra dripping with crystals. Take a look through our range and see what takes your fancy. We are constantly sourcing & updating products so if you don’t see what you are looking for the chances are we have it and just haven’t uploaded it yet! Drop us a line and we can help. Vintage china, crockery and tea set hire. Our vintage paterns are a bit like the flowers in a country garden-they look just right together, but in a nice, unplanned kind of way. If you are more the creative & hands on type why not take advantage of our dry hire DIY option? We can meet and advise on what you need and ensure you have all the correct get up and away you go, you’re free to design and create away! Or, if this thought sends shivers down your spine then let our creative team come along, liase with the venue and leave you to relax and enjoy. Drop us a line to get things started.